Custom RPE Charts, expanded PR widget, lots of new notes, navigation fixes (arrow/tab key), and Calendar functional updates round out the new features in this release. 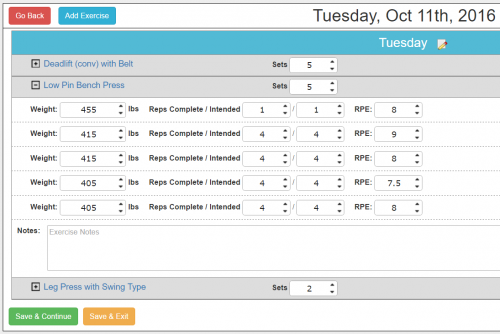 When you’re viewing the Training Log pages, you’ll notice a new tab in the sub-menu for Custom RPE charts. This page will allow you to create new custom RPE charts — as many as you want. Name them and save them. After you’re done creating them, head over to the revamped “Manage Exercises” tab to select a custom RPE chart for any movement you desire. Once you do this, the chart will be used to generate estimated 1RMs, PR’s, and more. 1) changing your RPE chart only changes FUTURE exercise entries. This is intentional. If you’d like to have the RPE chart also affect past entries, then you’ll need to edit those entries and re-save them. 2) You’ll designate a special RPE chart for an exercise. That will affect all the modifiers too. So designating a new chart for “Squat” will also be used for “Squat+bands” and any other modifier. This is also intentional as you probably don’t want to be making 30,000 RPE charts. You don’t need to anyway. 3) Just a side note about the Manage Exercise screens… you’ll notice Default Exercises don’t have edit/delete buttons. This is because you can’t edit/delete default exercises. We’ve actually added three layers of notes. The first are workout notes. These will be super obvious to everyone as you enter your data. Write whatever notes you want to keep in there, but we ask you to PLEASE DO NOT WRITE MESSAGES TO YOUR COACH IN THE WORKOUT NOTES. They likely won’t see it. Besides, that’s what email and other messaging platforms are for. The second kind of note are Exercise Performance Notes. To get to this note, while you’re on the edit screen, click the name of each exercise. These notes are to help you keep track of performance cues or setup instructions for each exercise/modifier combination. So for “Low Pin Squat”, you might write in what pin setting you use for your rack, or note that you’re adding the DB weights together for your Bulgarian Split Squats. The third kind of note is a Calendar Note. You can add a note directly to the calendar on a specific day using the plus icon on each day. This allows you to make a note of significant events like when a specific training cycle started, or if you get injured, etc. Again, we ask that you not use this to send messages to your coach because they could be missed. We’ve updated how the keyboard will navigate you around the Edit Workout screen. Now you can use the left-right arrow or the tab key. We hope this makes data entry a bit easier. The calendar has been made much more useful. Now you can add workouts, TRAC entries, and other events directly from the calendar using the plus icon (hover over a specific day). Now clicking on a workout brings up the “view workout” screen in a pop-up, which means searching for a particular session should be much easier. You can still easily edit or delete the workout using the on-screen buttons. We’ve also added a blue dot that will appear on the right side of any workout that has an attached video. This will make it easier for you to find the sessions where you have video to watch. That’s it for this round. We’ll be back to work building more useful stuff for you soon. If you have any feedback, please let me know. Thanks for using our web tools! 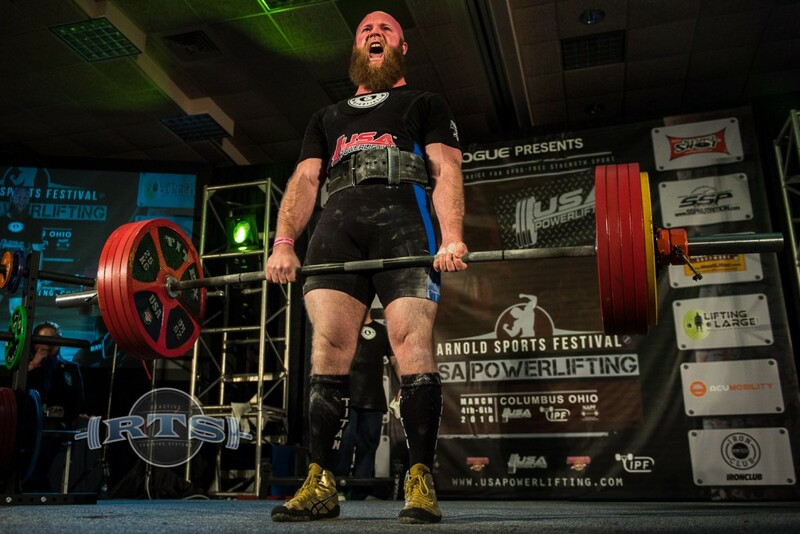 Lots of people talk about deadlifting, but you’ve got to examine the source that you’re listening to. I see people speaking about all sorts of things they have no authority on and the deadlift in particular is something that irritates me. It’s mostly because the deadlift is something I do have authority to speak on! 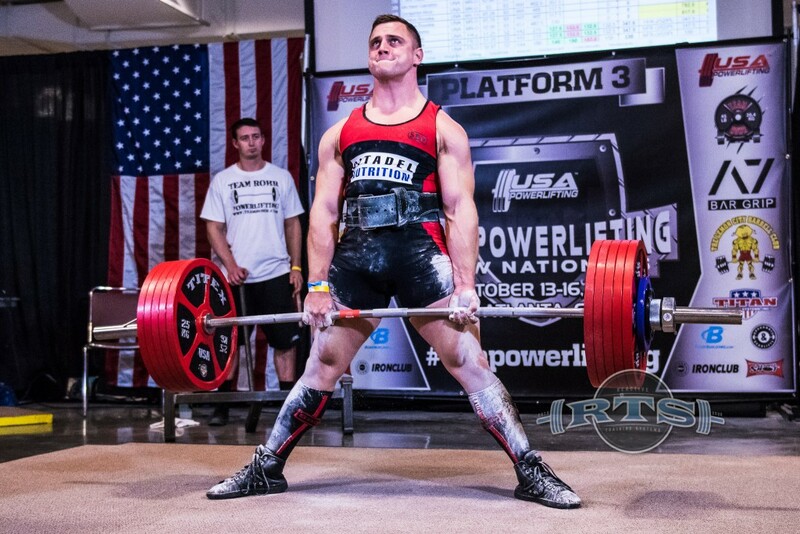 I’ve deadlifted 850 pounds myself while in the 275 pound weight class. 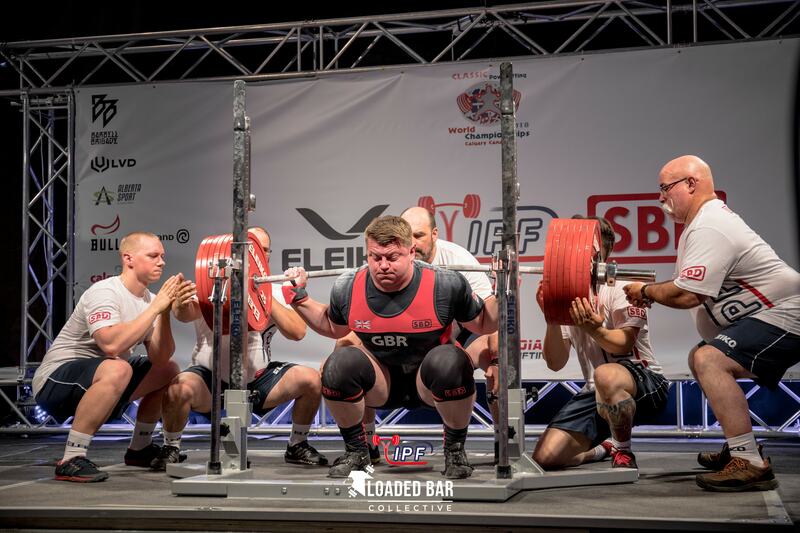 But it’s not just what I’ve done – I’ve coached literally hundreds of lifters to personal bests, which includes a variety of national and world records in a variety of different countries. These are legitimate records, too; not the “flavor-of-the-month-federations” that tend to come and go each year. Lots of people struggle to pull a deadlift through to the lockout and many lifters are perfectly capable of self-identifying this “lockout weakness”. The trouble I have seen is that the “lockout” is a pretty massive range of motion. Anything from the knees up is generally considered “lockout” in the deadlift. But consider that the bar starts 8 inches off the floor. That’s nearly mid-shin for lots of guys. So if you put it in this context, from the floor to the knees comprises about 1/3 of the range of motion for most guys. That leaves about 2/3 being from the knees up. Yes, that’s a large range of motion to consider “lockout” and not all of these lockout weaknesses will be the same.